﻿The SX7 Egg bar shoes are carefully fabricated using the Kerckhaert shoes and the same steel for the bars. Available in a variety of styles, these bar shoes have become the most popular brand in North America. The SX7 is used in a variety of disciplines, especially where strength and good support are required. Shoes are symmetrical (shoe fits left or right). Punched for 4-1/2 Regular, 5 Race or 5 Slim, depending on size. 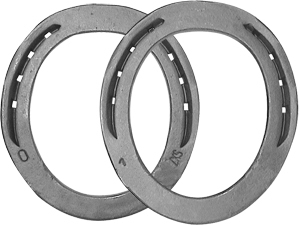 Farrier Product Distribution finished bar shoes are made by FPD from Kerckhaert SX7 horseshoes. These products have been developed and produced to specifications and standards suitable for the professional market.